System Mechanic is a great all-in-one tool to repair, clean, and speed up your computer. It features tool such as a startup optimizer, live booster, PC cleanup, privacy cleaner, netbooster, and much more! This program is a one stop shop for all your computer needs! I would like to thank the software developers that participated in this year's Christmas giveaways. I would also like to thank all our readers for a great year at PCbasics. The giveaway winners have been posted via the Rafflecopter app on the giveaway page here: http://www.pcbasics.info/giveaway.htm. SUPERAntiSpyware is the #1 solution for removing spyware from your computer. With four different scanning modes, completely remove all the spyware, not just the easy ones! 1-Click PC Tuneup [Giveaway] Winners! 1-Click PC Tuneup. Really is as simple as 1 click of a button. The program scans your PC for registry errors or junk files to speed up and un-clutter your computer. 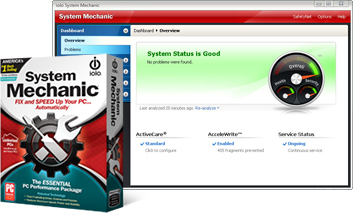 All you have to do is click "Fix Now" and the program will analyze your PC and fix the errors. Aimersoft DVD Ripper For Free! Clone2Go Video Converter Giveaway Winners!